Zion Market Research has published a new report titled “Chronic Disease Management Market by Disease Type (Arthritis, Cardiovascular Disease, Cancer, Diabetes, and Others), by Delivery Mode (Cloud-Based and On-Premises), by Service (Educational Services, Implementation Service, Consulting Service, and Others), and by End-User (Providers, Payers, and Others): Global Industry Perspective, Comprehensive Analysis, and Forecast, 2018–2024”. 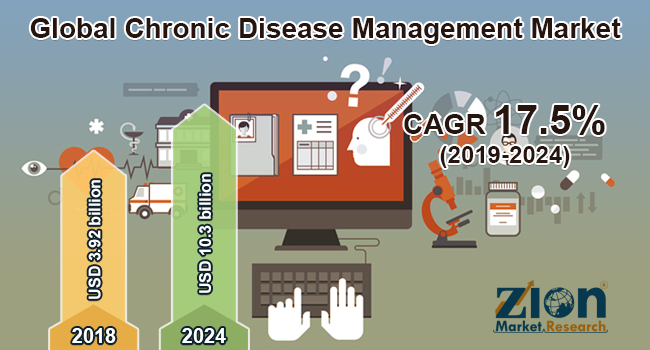 According to the report, the global chronic disease management market was valued at approximately USD 3.92 billion in 2018 and is expected to generate around USD 10.3 billion by 2024, at a CAGR of around 17.5% between 2019 and 2024. By region, North America is anticipated to dominate the chronic disease management market globally over the forecast time period. This can be attributed to the favorable government policies supporting the introduction of new and advanced services, substantial developments witnessed in the healthcare infrastructure, and funds for research granted by the government and ruling authorities. Asia Pacific region is anticipated to demonstrate the fastest growth rate over the forecast timeframe, owing to the region’s thriving healthcare industry due to a large population base, especially in India, China, and Japan.